When it comes to choosing timber for flooring, Crown cut grains, natural imperfections, knots and a clear wood grain is always sought after as it adds character to your space. Although smooth, shiny floors became standard, in recent years the distressed look is back in vogue. 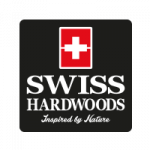 Swiss Hardwoods-Pure-European Oak-Single Strip; Thanks to this beautiful engineered floor with its emphasis on the natural imperfections, cuts and grains, you can now have that distressed effect that is all natural and pure as the name suggests.